Welcome to Henley Town Council Website. This page covers Events, Community Projects and Local Developments with which Henley Town Council are involved. There are always plenty of exciting things to report. The Council hopes that you find it useful and informative, and aims to be more responsive to public opinions by being more interactive. If you can spare the time please let us know your thoughts by emailing us at enquiries@henleytowncouncil.gov.uk as your comments are always most welcome. 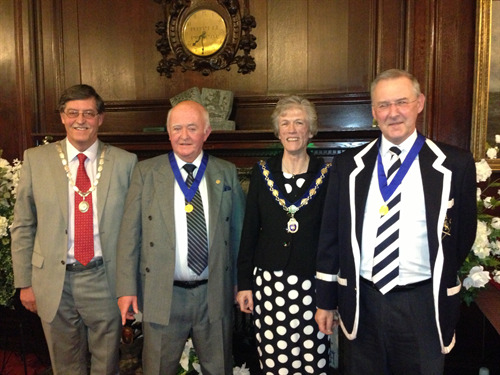 The Annual Town Medal Award for the Municipal Year 2013 - 2014 took place on the evening of 7th April 2014 in the Council Chamber of the Town Hall. This year the Medal was awarded to Mrs Wendy Hawkins, who was nominated for this prestigious award from the Music and Arts section of the town's voluntary sector. Mrs Wendy Hawkins is a joint founder member of Henley Choral Society which was set up in 1973 and is presently the Membership Secretary of the group. She works tirelessly to produce and promote musical excellence and awareness in the town. She volunteers for a number of different groups including the following: Henley Musical School, as a Staff Member; Pianist for Henley Carol Singers, who raise funds for many local charities; Organist and Choir mistress at Stoke Row Chapel for 30 years. 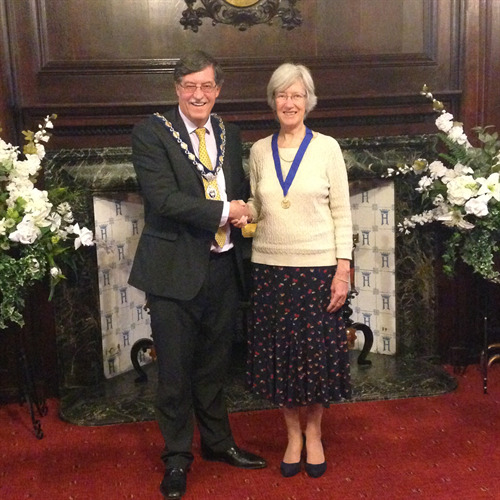 Mrs Hawkins was recognised for her contribution of over 40 years to the musical splendour of Henley on Thames and the time that she has dedicated to many local causes. The Annual Town Medal awards ceremony took place on the evening of Wednesday 6th March 2013 in the Council Chamber of the Town Hall. This year saw Mr Chris Boothroyd and Mr Ian McGaw as the two members of the community selected by the Council to receive this prestigious award for the 2012 - 2013 Municipal year. Mr Boothroyd had a very successful personal rowing career before turning his talents to coaching Junior Rowing. He has been Henley Rowing Clubs Chief Junior Coach for many years, consistently producing medal winning crews. Having worked quietly and tirelessly for the community over the past 30 years he will continue to coach individual crews to pass on his considerable knowledge and experience. Mr Boothroyd was awarded the medal for dedication to coaching local rowing and consistent success as one of the top rowing coaches in the country. Mr McGaw is a long standing member of the local Henley Bridge Rotary Club and undertakes a large amount of organisation work on a local voluntary level. He has organised the Henley Half Marathon for over 10 years and helped raised more than £180,000.00 for local charities. He also acts as a Governor for Henley college and is involved heavily with Henley CAB. Mr McGaw has always been very keen on rugby, is a member of Henley Rugby Club and is an active member of Henley Rugby Club Committee. We would also like to alert all residents (and those from further afield) to our various historic venues for hire if you are considering holding an event in the area. Our venue hire page gives further details but in particular we would like to share the news that the Town Hall now has a licence to hold weddings and civil ceremonies in any of the rooms that are available to hire. The facilities are proving very popular and feedback has been very positive. The rooms are a wonderful backdrop against which to enjoy your very special day. Do you enjoy gardening? Why not join our Gardening Buddies scheme? For further details see our page on town activities that you can get involved in.